Authorities in Venice, a city in northeastern Italy which is known throughout the world for its canals, carnival and architectural heritage, are considering banning people from sitting and lying on the ground as part of crackdown on what some officials describe as "boorish" tourists, The Guardian reports. The proposal has been brought forward by Venice Mayor Luigi Brugnaro and would enforce bans ranging between 50 and 500 euros if implemented. The city council is scheduled to vote on the proposal in October. The authorities are also considering banning music on boats, the principal means of transport for residents, as motor vehicle traffic is prohibited in Venice. Brugnaro has made it a priority to manage the tourism industry ever since his election in 2015. He has spearheaded efforts to manage the industry, with measures ranging from fines for unruly tourists to people-counters and increased police enforcement. Littering, dawdling or scantily-clad tourists can already be fined up to 500 euros. 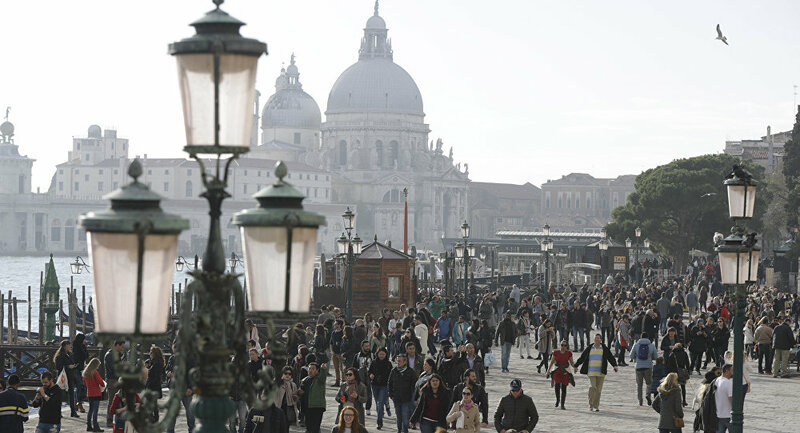 In May, Venice officials outlawed the opening of new takeaway food outlets for the next three years in a bid to clamp down on tourists snacking on church steps or on historic bridges. Last year, Venice's city council greenlighted a set of measures proposed by Brugnaro, including the installation of people-counters in heavily trafficked areas, an increase in police numbers, new maps with alternative tourist routes, and the promotion of offbeat Venice landmarks. A whopping 30 million people pour into Venice every year, vastly outnumbering its 55,000 permanent residents. This results in overcrowded walkways, congested waterways and long queues, which alienate locals and degrade the tourist experience, prompting authorities to map out measures to manage the tourist flow.